In my recent research on Leon & Eddie's of lost 52nd Street, I came upon the incredible Gottlieb Collection of jazz photos on flickr. 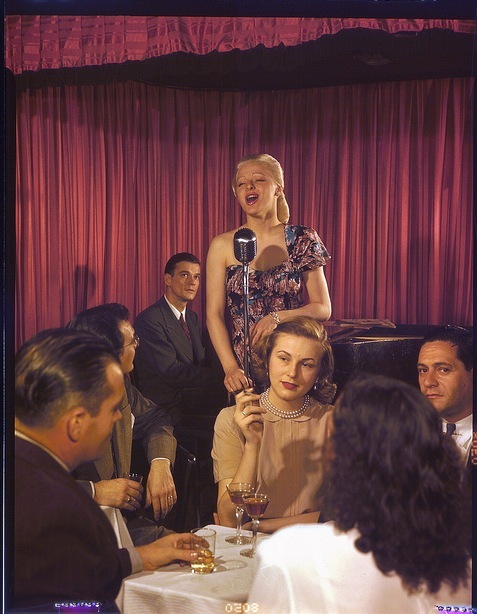 William Gottlieb, says the Library of Congress' note, "was both a notable jazz journalist and a self-taught photographer who captured the personalities of jazz musicians and told their stories with his camera and typewriter." 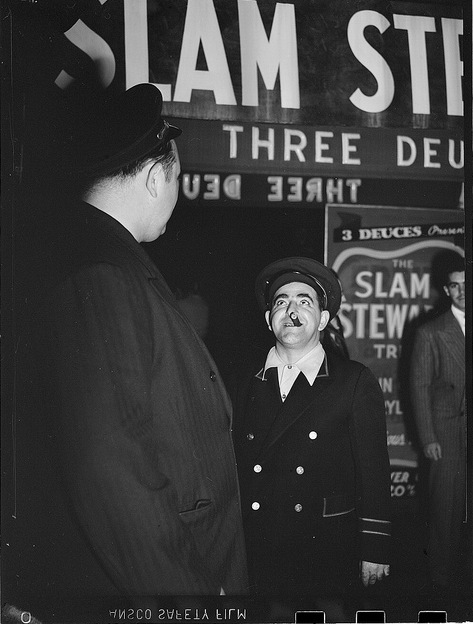 Many of the photos here come from 52nd Street, back when it was known as "Swing Street." In the collection you'll find many shots of the greats, including Billie Holiday and Ella Fitzgerald, but it's the faces of the forgotten and lesser known that I find most exciting. 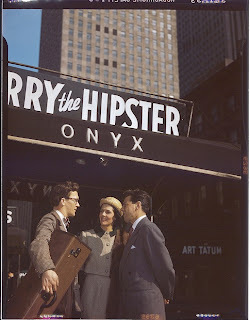 Like Harry "The Hipster" Gibson, the man who claimed to have originally coined the term "hipster" between 1939 and 1945. It was his stage name when 52nd was his musical home. Notes Wikipedia, "His career went into a tailspin in 1947, when his song 'Who Put the Benzedrine in Mrs. Murphy's Ovaltine' put him on the music industry blacklist." Too bad, it's a great title. In black-and-white, there's a fellow named Gilbert Pinkus. Down Beat recalled him: "Pinkus, Gilbert G. Pinkus, that is, is the Mayor of 52nd street. Pinkus has been a doorman on The Street for 16 years and his honorary title is a tribute to his fortitude. The Big Cigar with the Little Man has outlasted all other of the denizens of Characters' Alley..."
He died in 1980 after being hit by a truck. 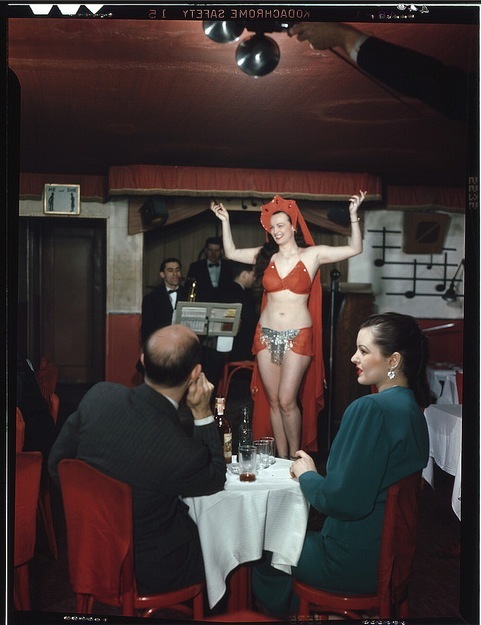 Through Gottlieb's photos, we get a rare glimpse inside the nightclubs that made 52nd Street so famous and beloved. 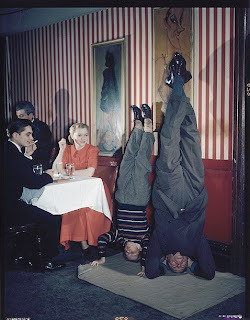 There's Tony Soma doing a headstand at Tony's--probably singing a Verdi or Puccini aria, as he liked to do upside-down. Dorothy Parker used to frequent his place when it was a speakeasy. In the 1920s, when a bartender at Tony's asked Parker, "What are you having?" she reportedly replied, "Not much fun." And there is the lovely Lois De Fee, "Queen of the Amazons." At six-foot-four, she was hailed by Walter Winchell as the "Eiffel Eyeful." She married actor Billy Curtis, one-time Munchkin, for the publicity. TIME announced: "Midget Billy Curtis, 29, 3 ft. 6 in., 79 lb., last January married onetime Manhattan nightclub Bouncer Lois De Fee, 19, 6 ft. 4 in., 190 lb. Last week little Billy Curtis, suing his big bride for divorce, complained: 'She treated me like a doll.'" Q: How did the midget make love to Lois De Fee? A: Someone put him up to it. On that subject, Lois said, "We didn't--I mean, we were married at three o'clock in the afternoon in Miami, and the half pint took a plane for New York at seven o'clock that evening, and we didn't--that is--oh hell! We didn't. I applied for an annulment the next day." Not everyone is named in the photo collection. Here, an anonymous chanteuse sings amid red draperies while nightclubbers smoke and drink at white-clothed tables. The colors are stunning. And there's more. So many more--over 1,300 photos in the collection. Some notable shots include: A look into a secret booze vault (21's? ), an eerie home tour with Mr. Edwin Finckel, the pipe-cluttered desk of one Brick Fleagle, colorful scenes onstage at Leon & Eddie's, the studio of a bohemian painter at work, bassist Vivien Garry of the amazing hairdo, a shot of the Apollo in 1946, three guys named Pee Wee, Muggsy, and Miff (plus one Joe), Louis Armstrong in his dressing room, Billie Holiday with her dog Mister (and a pineapple), Cab Calloway combing his hair, etc., etc., etc. J., you really hit paydirt with the Gottlieb Collection. Fantastic! 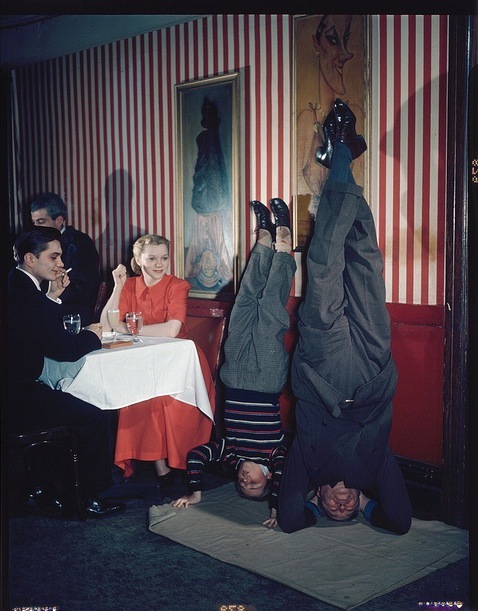 I am loving this 52nd Street junket. great post! I used to work at the old St. Clare's Hospital on 52nd street (west of this) and I love reading about what the block once was. The pictures are excellent, thank you! Wow... incredible photos... Nice find! Great photos and stories to accompany them! 'Who Put the Benzedrine in Mrs. Murphy's Ovaltine' is the best title to a song I've ever heard! Nice work. Benzedrine and Ovaltine. two words you rarely hear these days. unlikely to turn up as a rapper's rhyme. I'm with Marty - and I'd love to hear "Who Put the Benzedrine in Mrs. Murphy's Ovaltine" performed. These images are an excellent look back in time. Thanks for sharing! way to be proactive Marty! love it. thanks for adding it. another good question from the Hipster: "who put the Nembutols in Mr. Murphy's overalls?" Absolutely outstanding. Thank you Jeremiah, you made my week. Just adding my kudos! I didn't know about the Gottlieb Collection. Thank you! I especialy love the pic of Louis Armstrong. If you haven’t been to see his home in Corona, it’s definitely worth a visit. It feels really special just to be inside those rooms. But, of all the gin joints in all the towns in all the world, why 52nd Street? According to the erudite jazz historian, Phil Schapf, of WKCR, Columbia and Lincoln Center, the reason is that when Radio City Music Hall was constructed, it had, of course, network giant NBC there, which would broadcast jazz performances all over the country. Because of the three-hour time difference between the east and west coasts, there would be two different live broadcasts nightly, resulting in an hour or so down time for the musicians. 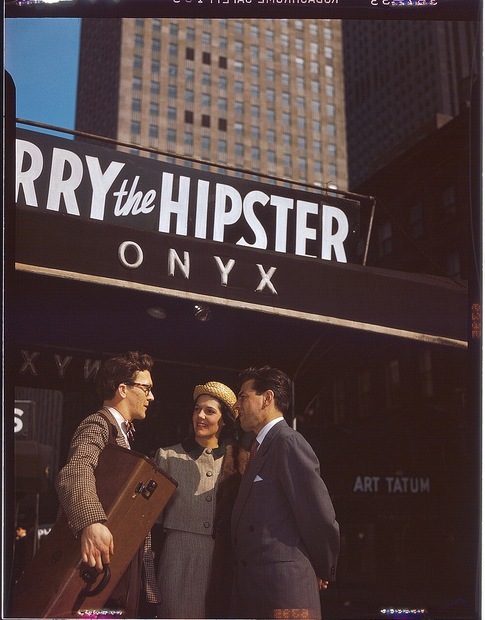 Taking a break, they would duck out for a drink at the nearest gin joints, namely, those directly around the corner on 52nd Street, a heretofore non-descript midtown street. They then would gig there. 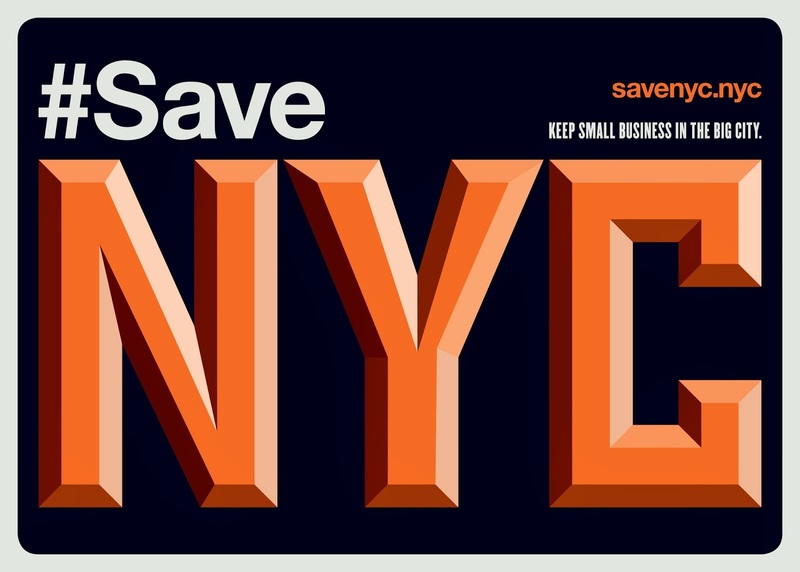 This would gave birth to the phenomenon known as "52nd Street". @Marty - thanks for finding that! Sean, thanks for that explanation. so we have Radio City to thank.